At a relatively affordable price, the Bowflex TreadClimber TC1000 is manufactured and designed with features that are vital in providing revolutionary experience and winning results. The Bowflex TreadClimber combines the power of three exercising machines namely, the stair climber, elliptical trainer, and treadmill. With the benefits of these units combined, you will definitely get what your expected result. Whether you long for toned muscles or weight loss, the TC1000 can help you achieve your fitness goals. With the price of $1298, it wouldn’t hurt to try this entry-level TreadClimber that promises to give you a different kind of workout compared to that of treadmills. Providing a cost-effective way of burning calories, losing fat, and reducing those inches, the TC1000 promises the user to achieve these results in just four weeks, provided that you give utmost dedication and time on your regular work out program. The Bowflex TC1000 is designed with electronics that provides up to 12 levels of intensity adjustment, giving you a wide range of workout levels. The TC1000 is then suitable for either beginners or skilled runners. The hydraulic resistance of the machine makes use of two separate belts, providing an effective way of burning calories. However, such design might limit your movements. Moreover, the lack of durability of its shocks will cause you to have them replaced earlier than usual. Adjust the speed of the machine between 0.5 and 3.8 mph. Whether your exercise is for leisure or training purposes, you have a wide range of speed options to choose from. Plus, get to see your workout stats including speed, distance, and time with its three large LCD screens built in the machine. The large footboards of the machine make it safe in starting and stopping your exercise. Positioned along the tread belts, they provide easy access for any body type, height, and weight. Backed by Bowflex 100% Satisfaction Guarantee, you can use the Bowflex TreadClimber TC1000 for up to six weeks to try and check its effectiveness. If by then, you are not convinced with the results, you can return it and get a refund, but deducting the shipping and handling fees. For its price, expect that it may also be cheap-looking. The 3 LCD readout windows are quite small, while the hydraulic shocks lack sturdiness. Moreover, the over-all movement of the machine seems to be complex. It is more complicated than an elliptical trainer and a treadmill in terms of function. 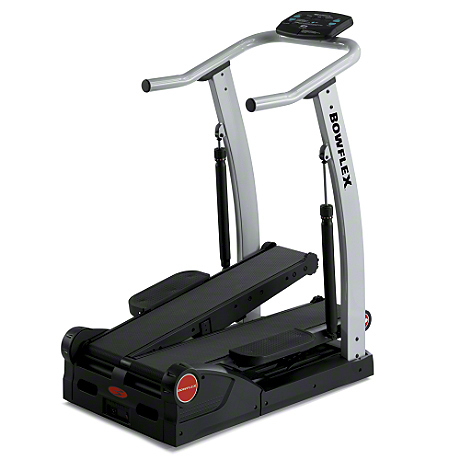 The Bowflex TreadClimber TC1000 is extremely popular with its affordable price. Though there are a few minor downsides on the machine, it is still worth trying out, especially since you can return it when you don’t get satisfied with the result. With its compact design, it can provide you with a low-impact, high-intensity cardio workout that’s just what you need! However, before you decide to buy, you might like to first visit our best buy treadmills page to see treadmills that we recommend.